Take Action to Keep Families Together! Almost 1,800 families have been separated by border officials. Contact the Senate Judiciary Committee to voice your support for the Keep Families Together Act, which would end routine family separation at the border. Our hearts are heavy for the children and parents who have been separated at the border and kept in detention centers. Even the UN has spoken out and called on the US to stop this inhumane practice. Sen. Dianne Feinstein (D-CA) has recently introduced a new bill which would limit family separation at the border and prevent family separation “solely for the policy goal of deterring individuals from migrating to the United States.” New Jersey senators Cory Booker and Bob Menendez are co-sponsors. The bill is now in the Senate Judiciary Committee. And we need to make some phone calls! I am contacting you because you’re the chair of my Senate Judiciary Committee. I am appalled at the separation of families at the border. It needs to stop NOW. 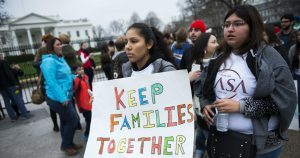 Support Sen. Feinstein’s new bill, the Keep Families Together Act. Schedule it for a hearing and vote immediately. Thank you for co-sponsoring the Keep Families Together Act. Please do everything you can to move the bill forward in the Senate Judiciary Committee. Hate making phone calls? No problem, call after hours and leave a voicemail! ← You Can Help Protect the Mueller Investigation in Just 4 Minutes!